Bollards, sometimes called security posts, are a real necessity to set off areas and protect people, vehicles, buildings and property. However, drab steel bollards can sometimes detract from the surrounding architecture, particularly as they develop dents and scratches over time. The good news is that there is an economical, easy way to not only add new life to your bollards, but to turn them into visual assets with traditionally styled, decorative plastic bollard covers. Decorative plastic bollard covers transform unattractive security posts into architectural highlights while providing an unsurpassed level of protection. Take as an example Reliance Foundry’s model R-7176 plastic bollard cover. Its fluted shaft and domed cap were inspired by Roman columns, and they help achieve a refined ambiance for streetscapes and buildings. This plastic post cover is the perfect combination of classic ornamentation and functional thermoplastic. Of course, you will want to look at all the decorative plastic bollard covers Reliance Foundry has to offer, a selection that coincides with the dimensions of most standard security posts. “Best of all, they are available at a fraction of the cost of steel and iron bollard covers. Since they are made of polyethylene thermoplastic, they can be sold at a fraction of the cost of metal models.” says Reliance Foundry Vice President of Sales and Marketing, Brad Done. Our more decorative plastic bollard covers, like our standard ones, contain ultra-violet and anti-static additives that deliver the ultimate in environmental durability. They protect steel pipe bollards and bumper posts from snow, rain, harmful UV rays, dents and scratches, and road chemicals such as solvents and de-icing salts. Because they protect steel security posts from oxidation and rust, they eliminate most of the post’s maintenance requirements; you can kiss the expense of yearly painting good-bye. Our plastic bollard covers look great for a very, very long time, and present a fresh and new appearance longer than painted bollards. They last 5 to 15 years depending upon environmental conditions. At the end of its service life, each plastic bollard cover is fully recyclable. Like our standard covers, our decorative plastic bollard covers can be installed in a matter of minutes without hardware. Although you can cover dented or scratched posts, it is important to remember that a plastic bollard cover will only perform as well as the post on which it has been installed; if the post is crooked or damaged severely, it should be replaced. If the post is rusty, you will need to remove the rust before installing the cover in order to prevent further damage to the post. Rust can be removed with a steel brush, steel wool anti-scouring pads or fine sandpaper. Once the post has been cleaned and allowed to dry, you just affix provided Ideal Shield™ tape to the post and slide the plastic bollard cover over it. The tape permanently sets the post cover to reduce the likelihood of theft. Some people also use spray foam insulation to install decorative plastic bollard covers. 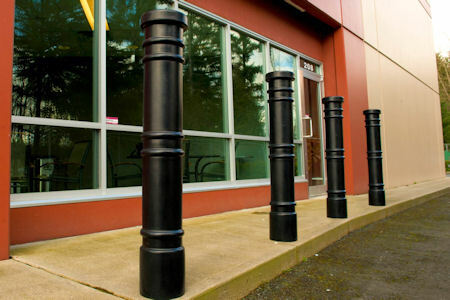 Check out further tips about how to install decorative plastic bollard covers. Reliance Foundry has ten decorative models available. Depending on current production lead times, after an order is placed they will generally ship within 2 weeks from a centrally located U.S. facility. Decorative plastic bollard covers by Reliance Foundry deliver the traditional aesthetics of metal bollards and the functionality and durability of contemporary thermoplastic. Reliance Foundry has been a trusted supplier of cast metal products since 1927. Specialists in bollard design, production and installation, Reliance Foundry’s innovative catalogue also features cutting-edge bike racks and industrial-grade, steel wheels. Reliance Foundry sources cast metal solutions from across the globe to provide competitive prices and conveniently ships to all locations within North America. Shop Plastic Post Covers Now!